Save My Favorite Records from the Decay and the Elements. 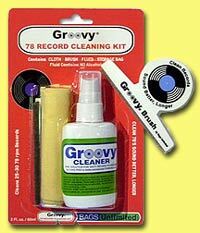 78rpm & Vinyl Record Storage & Storage Materials. Knowledge of the materials that 78rpm & Vinyl Records have been made from of over the years will help you to properly care for your record collection. The following is a list of the various materials used to make 78rpm & Vinyl Records and possible degenerative issues with each type of material. 1. Some of the first sound recordings were made on Acetate. The base of the disc was made from aluminum, glass or cardboard, which was then coated with lacquer and plasticized with castor oil. Shrinkage of the lacquer coating due to loss of the castor oil plasticizer is the primary source of destruction of these discs. Excess moisture and heat will accelerate plasticizer loss also. Acetate is very susceptible to fungus growth. 2. Another material used to make some of the first sound recordings was Shellac. Some were made from organic shellac and some were made from commercial resins. It is difficult to discern which is which, but most recordings after WWII were made with resins such as Vinsol, Valtie and Vinyl chloride acetate. Many different fillers were used to make the cores of the earliest records-therefore there is no consistent behavior in the degenerative behavior of these records. The shellac itself is resistant to fungus attack, but the wide variety of materials used for the cores, may not be. High humidity levels accelerate the embrittlement of shellac discs. 3. The Edison Diamond discs were the first synthetic discs. They were made from a material called Phenol (also used in the manufacture of Bakelite). This material is generally very stable, but can be affected by moisture and severe humidity changes. It is not however prone to bacteria, fungi or insect attack. Vinyl records (33-1/3 LP and 45rpm) are made from polyvinyl chloride (PVC). It has proven to be the most stable material for sound recording. Vinyl will however degrade chemically when exposed to ultraviolet light or to heat. Humidity does not affect the PVC itself, but will affect the packaging it is stored in. PVC is also resistant to fungal growth. Information on record material types was taken in part from 'The Care and Handling of Recorded Sound Materials' by Gilles St-Laurent Music Division of the National Library of Canada, January 1996. 7 Canal Street · Rochester, NY 14608 Copyright © 2001-2004 Bags Unlimited, Inc. All Rights Reserved.